The residential client lives in a high rise building in the West Loop neighborhood of Chicago. The client’s unit is on the 10th floor with prominent southern and western exposures which offer beautiful views of the patio, South Loop sky scrapers and other historical structures in the West Loop neighborhood. The client’s interior includes highly valuable interiors including new wood flooring, historical artwork and a beautiful grand piano. This project presented several solar control challenges including providing adequate protection from UV and heat transmission, preserving the amazing views and natural daylighting provided by the exterior window walls and, finally, maintaining a high level of privacy from the city lights and neighboring buildings. – All Motorized Dual Shade Systems were controlled with RTS Somfy 500 series motors. – All 4″ fascia made of aluminum extrusions. A total of 15 Illinois Window Shade Co. Dual Roller Shade Systems were used throughout the unit in order to satisfy the client’s desire to protect the interiors from solar UV and heat transmission while preserving views of the exterior. Dual Roller Shade Systems integrate two fabric rolls that can be independently lowered or raised by the specified control system. The fabrics often paired together include a transparent and room darkening fabric. The shades are housed on combined brackets. Illinois Window Shade Co. customized each of the shades in the dual system to the specifications of the client. The client specified that the shade fabric closest to the window be Mermet Koolblack E Screen Charcoal/Charcoal with 3% openness and the fabric closest to the interior beMermet Avila room darkening (0% openness). Mermet’s Koolblack utilizes a patented technology that allows darker fabrics to reflect solar heat at a much higher rate than typical dark fabrics. The darker fabric also reflects light thereby reducing glare and preserving the outstanding views. Meanwhile, Mermet’s Avila room darkening fabric provides complete UV blockage, solar protection and privacy. Illinois Window Shade Co. Dual Roller Shade Systems are available in both motorized and clutch operating systems. The client specified RTS Motorized Dual Shade Systems for high-traffic areas that included valuable interiors such as the living, dining and piano rooms. The client specified Clutch-Operated Dual Shade Systems for the bedroom and office. 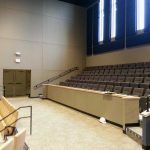 The Dual Shade Systems were fitted with matching 4″ aluminum fascia which conceals the individual fabric rolls and provides a sleek, continuous design. The Illinois Window Shade Co. Dual Shade Systems look fantastic, are easy to operate and are producing measurable results with respect to the light, heat and UV levels in the client’s unit. The client has specifically noted an improvement in energy efficiency (lower energy costs, higher levels of comfort) and UV protection for the valuable interiors. The Motorized Dual Shade Systems provide a quiet, effortless means to control the shades in the high traffic areas. Meanwhile, the manual clutch operation offers a simple, smooth means to control the lesser-used shades. Architect and design communities across the country are working to design sustainable solutions that reduce facility construction and operating costs while enhancing safety and comfort. 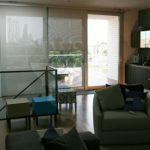 The proper window shade addresses these challenges in a cost effective and practical manner. Well-designed motorized and manual shading solutions not only save energy and money, but also optimize natural light. Home of the PowerMove® and SmoothMove® solar shade systems, Illinois Window Shade Company (IWS) manufactures superior shade systems that effectively manage solar light and heat transmissions. Since 1905. Join our email newsletter for product updates, industry news and project insights!